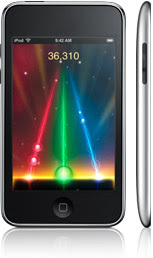 September 9, 2008 Steve Jobs announce the introduction of the Newest iPod Touch. the new iPod touch features an amazingly thin contoured metal design, a gorgeous 3.5-inch wide screen glass display, 802.11 b/g Wi-Fi wireless networking, integrated volume control buttons, a built-in speaker for casual listening, a built-in accelerometer and other advanced sensors, and Apple’s revolutionary Multi-Touch interface. Available now in 8GB, 16GB, and 32GB models.